The withering leaves beyond the galls may be the easiest way to spot them. For anyone who finds some to collect, I would recommend cutting the twigs several inches below the gall and putting them in a resealable plastic bag right away to retain moisture. The larvae seem to develop pretty quickly, so I would say go ahead and collect any you find, rather than waiting to make sure they are mature. 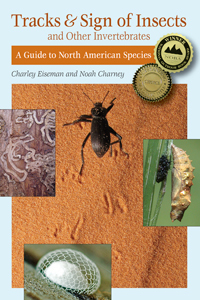 Over the following winter, as I began reviewing all the published information on North American leafminers, it became clear that this wasn’t a mine that anybody knew about. So when I returned to Nantucket in early August of 2012, I made a point of looking for more examples, and I found them to be abundant there. I noticed that they always ended up at the midrib near the base of the leaf, and on close inspection I could see that the mines continued down the petiole. The Marmara larva I had photographed was nowhere near mature, and having seen Marmara bark mines on other hosts like ash and pine, I knew they can be very long—it was no wonder the sprigs I had collected hadn’t been big enough for the larvae to complete their development. Marmara species typically have a year-long life cycle that involves overwintering in the bark, then continuing to feed in the spring and transforming to an adult around June. In June of 2013, I returned to Nantucket and found that there were in fact bark mines visible on some arrowwood plants, though mostly for short stretches; it was clear that most of the feeding trail was too deep to see, and following it to its end would be impossible. Some Marmara species conveniently spin their cocoons at the ends of their mines, but others exit the mine and wander off before pupating, and there was no way to know what this one did. I searched the plants that had visible bark mines, but I didn’t see any signs of cocoons, so I assumed this was a species that wanders off. Recognizing from the horn at the back end that they were some kind of sphinx moth (Sphingidae) caterpillar, and knowing that the host was Viburnum, it was easy to identify them (using Dave Wagner’s guide to eastern caterpillars) as immature hummingbird moths (Hemaris thysbe). I’d had no idea what hummingbird moth caterpillars looked like before then. On one or two of the Nantucket arrowwood plants, I had seen the Marmara mines going within a few inches of the ground before disappearing again. I mentioned this to Dave, and he thought it was likely that this species overwinters in the bark of the roots. This is not unheard of; the mine of M. basidendroca on green ash (Fraxinus pennsylvanica) extends up to 7 cm below ground before resurfacing for pupation and emergence of the adult. It looked like drastic measures would be required to learn the identity of this moth. So in the summer of 2014, Julia and I returned to Nantucket and tied pink flagging on several arrowwood plants that had leaf mines. Unfortunately, the mines weren’t nearly as common that year as they had been in 2012. Julia returned in December and dug up and potted the flagged plants. Meanwhile, I had found a few examples of the mines in the Berkshires of western Massachusetts—on wild raisin (Viburnum nudum) and hobblebush (V. lantanoides) as well as on arrowwood—and I had potted a couple of those too. Julia sewed some bags from transparent fabric to surround the potted plants and trap any emerging insects. We kept the plants in our shed all winter. Last spring, we brought all the bagged plants into our kitchen and checked them several times a day for any signs of life. On April 2, this 6-mm sawfly emerged—a male, given its fancy antennae. Dave Smith identified it as a species of Monoctenus (Diprionidae), which would have fed as a larva on juniper foliage, then burrowed into the soil among the arrowwood roots to overwinter and pupate. On April 13, this 2-mm wasp emerged. I thought it might be a parasitoid of the Marmara, but it turned out to be an Encyrtus (Encyrtidae), which must have emerged from a scale insect on the bark of the arrowwood. Toward the end of April, a moth finally emerged—but it was a tortricid, not a Marmara. Specifically, this 8-mm moth was Zomaria interruptolineana, whose larva is a leaftier on blueberry and huckleberry, both of which are abundant on Nantucket. Coincidentally, I’d photographed this same moth species on an arrowwood leaf on June 10, 2013, at the same location where Julia dug up that plant. But alas, no Marmara adults ever emerged. Of course, both cocoons were already empty, so we had no hope of getting adults from them, but now we know there’s no need to dig up the plants to rear them; we just need to search more carefully for these bark flaps in the spring. These were several feet off the ground, so apparently the larva doesn’t always mine all the way to the roots—or if so, it may mine all the way back to the height of its original leaf mine. These “bubbles” are expelled through the walls of the cocoon, for unknown reasons, by the larvae of certain genera of Gracillariinae. Interestingly, the Marmara species that spin their cocoons under bark flaps at the end of their mines aren’t supposed to make these bubbles, so it seems pretty clear that this is a new species rather than a described one using a previously undocumented host plant. Anyway, if you have any kind of viburnum near you, please keep an eye out for these bark flaps this spring. Of course, it would be easier to know which plants to look at if you had flagged plants that had leaf mines on them last year, but maybe you’ll luck out as we did in Illinois. For whatever reason, I’ve never found the mines in the central part of Massachusetts where I live, even though I’ve found many examples in the extreme western and eastern parts of the state. Not all bark mines are caused by Marmara species; they can also be the work of other moths such as Zimmermannia, a subgenus of Ectoedemia (Nepticulidae). Or possibly something else. 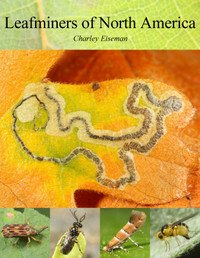 I’m including bark mines in the keys in my leafminer book, because let’s face it, no one is ever going to write a whole book about bark mines. This entry was posted in Uncategorized, Unsolved Mysteries and tagged Agromyzidae, arrowwood, bark mine, caterpillar, Ceanothus, Ceanothus sanguineus, Cecidomyiidae, Celtis, Celtis occidentalis, cocoon, Diprionidae, Diptera, Encyrtidae, Encyrtus, fly, gall, gall midge, Gracillariidae, hackberry, Hemaris, Hemaris thysbe, hummingbird moth, Hymenoptera, larva, leaf mine, Lepidoptera, Marmara, Monoctenus, Nantucket, new species, parasitoid, Phyllonorycter, Phyllonorycter viburnella, Sackenomyia commota, sawfly, Sphingidae, sphinx moth, Tortricidae, Tuckernuck, Viburnum, Viburnum dentatum, Zomaria interruptolineana. Bookmark the permalink. Awesome detective work and persistence, Charley and Julia! Cool stuff!!! You two must be some nature nuts like us. 🙂 We have lots of viburnum on our road and have planted lots here so we will keep watch. It’s fascinating that larvae just pupated….we are so excited to see what it turns into. Fingers crossed for a successful metamorphosis! Since reading your posts, I’ve been looking at hackberry routinely this spring in central Missouri, and I finally found a couple of galls just this afternoon. One has a presumed exit hole as shown in the photo. The other doesn’t seem to have a hole, but it is shorter than the the typical described length, so I’m not sure what’s going on with it. I collected both, and I suspect I can find more if I find time to keep looking, though it may well be too late. I’d be interested to read more about your methods for rearing such critters, though.